Jack's New Crazy Lottery Winning System... But Could It Work Maybe? Jack's eyes twinkled as he pulled up a chair in my home office. "Hey Ken," he said, stretching his feet out with a self-satisfied smile and putting his coffee on my desk. "I've got something to tell you that will knock your socks off." "So you've decided to buy my System?" I questioned. "Better than that," he said, "I've just thought of a new way to win, and I can't see why no-one's figured it out before." He sat up. "Want to know how it works?" "Do I have to sign a Non Disclosure Agreement for the privilege?" I grinned. Jack was always coming up with crazy schemes, and some of them would probably make him a great deal of royalty payments one day. But, also - some were outright wacky. "Not this time," he said. "Now, what do you know about popular, most played numbers?" "Well," I said, playing the dumb expert, "maybe you tell me." 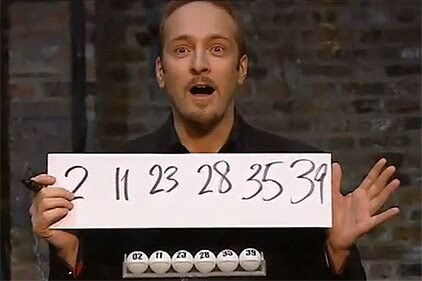 TV Macigian Derryn Brown claimed to predict the UK lottery - would Jack's system beat it? "OK," he leaned forward and looked round conspiringly. "If you go to many of the official lotto websites, they give you a list of the most drawn numbers." "Yes," I agreed. "calottery.com has a web page here for the Mega Millions game." "OK," Jack continued. "All you have to do is get the 6 most popular numbers and play them every game. It's a cinch and cheap as well!" He sat back and looked expectantly at me. "It's already set up for us by the lotto sites themselves - you don't have to do any figuring! Have I hit the jackpot?" "Good idea," I said, "but it won't work. Your idea works on positive frequency... the number of times they were drawn over many games. You got to think sequence. These numbers come from different games at different times, and the chance of them all coming together in a sequence in one game is very unlikely." I went on to explain to Jack that the idea was also flawed because it relied on the wrong end of the computation - the winning end. Most other systems incorrectly work this way... they try to isolate and predict the winning numbers at any given time. There is no logical way to do this. Believe me - I said to Jack - with the enormous winning prizes in lotteries today, there are thousands of players round the world working on schemes every day to try and break the code. And strangely, despite all the complex mathematical mumbo-jumbo, none of them even come close to working. Just go to any of the large number of forums on playing systems, and you will see that no-one matches the winning predictions there. I have the largest number of lottery winner testimonials that I have seen anywhere, and it's because my Silver Lotto System works in a completely different way to the rest of the world. That's why my Silverites (buyers of my system) get so much success. He shrugged. "Back to the drawing board! Maybe I should look at your System. What's the best deal?" "You need my Silver Lotto PRO," I said. "It uses several key elements that work together to get better results." Jack threw his wallet across the desk at me. "Take a look inside," he said. "Have I got enough for it?" "You've already got my Silver Lotto System and LottoPredict," I explained, looking at the notes. "You've got a hundred there, so you'll get plenty change," I said. "You just need PRO Custom Profiles which right now are US$88." "What about a discount for a friend?" he joked. "I'll see what I can do..." I smiled, "... but since they were $148 to start with, there's not much profit in it for me. Just order from your Silver Lotto Membership Site and give me a couple of days to make them up for you." "So they really are customized," Jack said. "Sounds like a lot more work than your System." "Yes," I agreed, "but you don't have to do anything - and it also gets you winning - which is way better than your system!" Ken, I played your Silver Lottery for 3 weeks and got $75,000 between 2 games. To say I'm amazed is an understatement. My family have just been told and it is like a giant birthday for them. I will be sending my daughter on a trip next weekend and paying the bills too. Thank you again for all your help.